One thing that everyone could use more of is storage space. We tend to collect a lot of stuff! What can cause a mess real fast are all of those small trinkets and small supplies. Keeping them organized requires some creativity. One solution that I have come up with is using an old toolbox. All of the little trays and sections are super handy for those small supplies. I picked up this old rusty tool box from a barn sale with the intention of making it over for decorative storage. At first glance, the box make look a little too worse for wear. However, I had some plans that were going to get it in perfect condition for storing craft supplies while at the same time adding some cool rustic decor to my craft room. First I brushed it off real good with a small scrub brush to get all of the loose rust and dirt off. I would recommend wearing goggles or glasses for this, if there is a lot of rust, because I ended up with some small dust particles in my eyes when I tipped the box over into the trash….oops. Next, I wiped the tool box down with a wet rag. It was now ready for a protective coat of polyurethane. I initially brushed on a coat of satin polyurethane over the entire surface to seal the rusty finish and keep it from rubbing off. Doing this also makes the finish a little darker like a brown rust instead of the natural orangy rust. When the whole project was complete, I lightly sprayed the whole thing with some spray varnish. Once the polyurethane was dry, I added other embellishments like vintage song sheets and burlap to line the inside and a couple of fun metal labels. The song sheets and burlap were decoupaged in with Mod Podge which provides a nice durable finish. I distressed the edges with paint to blend with the rustic box. I also painted the inside of the lid. 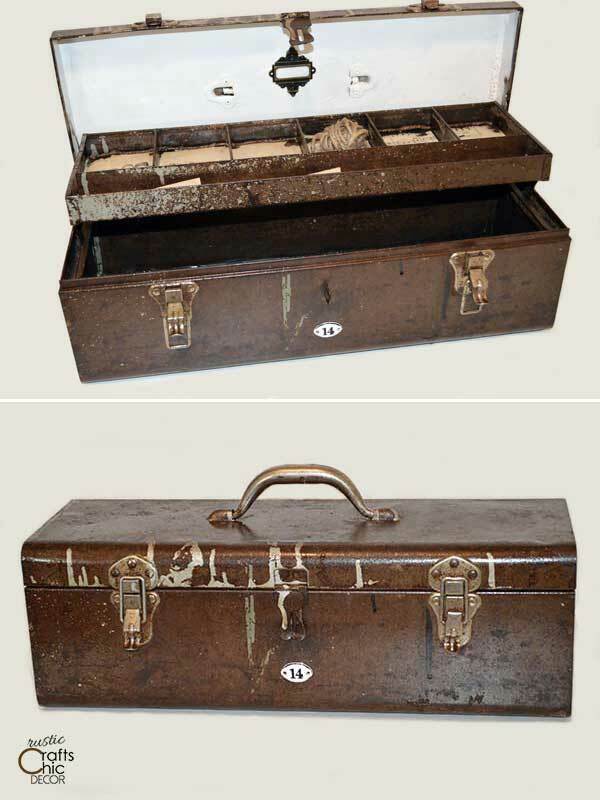 I found an idea for a storage toolbox with added legs. 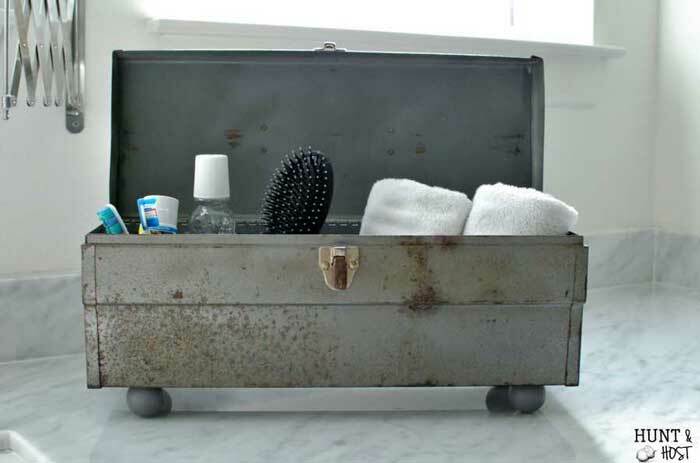 This added embellishment is super stylish and makes a great storage container for in the bathroom. 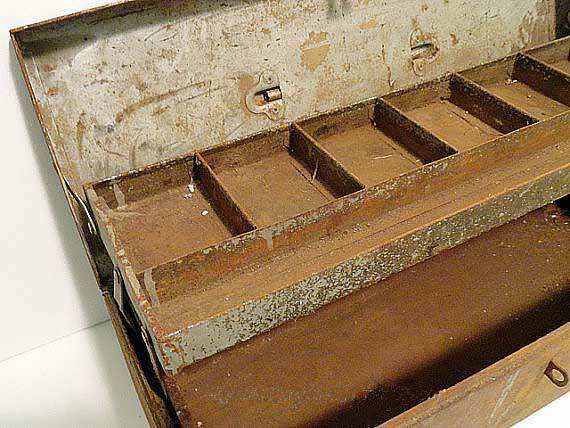 If you would prefer a cleaner look, you can always fully restore the toolbox. A good cleaning and stripping along with new paint gives a crisp clean look. 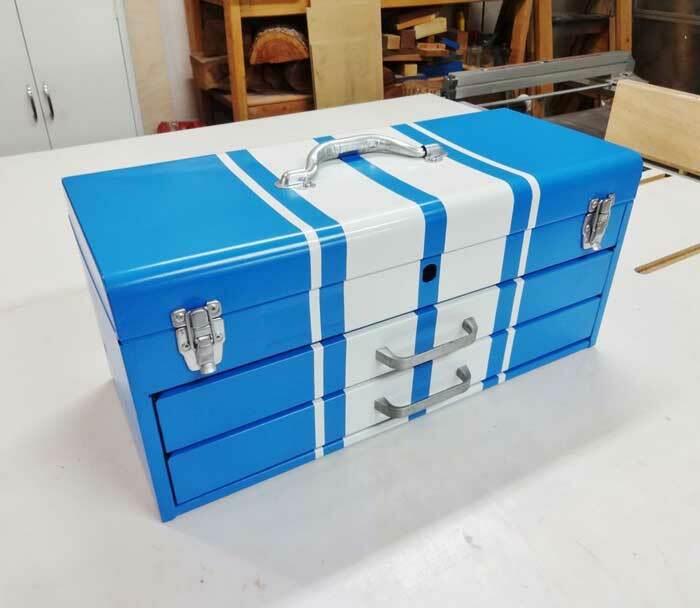 This old toolbox was fully restored and painted with a grain sack stripe. Wooden toolboxes can also be used for open storage although I like to use them for centerpieces.